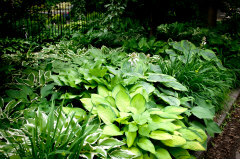 Tired of the expense of mulching your garden every year? Try ground covers! Most people think of ivy, vinca and pacasandra when they hear the term “ground cover” but there are so many other ground cover possibilities available! Many spreading perennials will do the job of protecting the soil, crowding out weeds and also give you lots of color throughout the season!